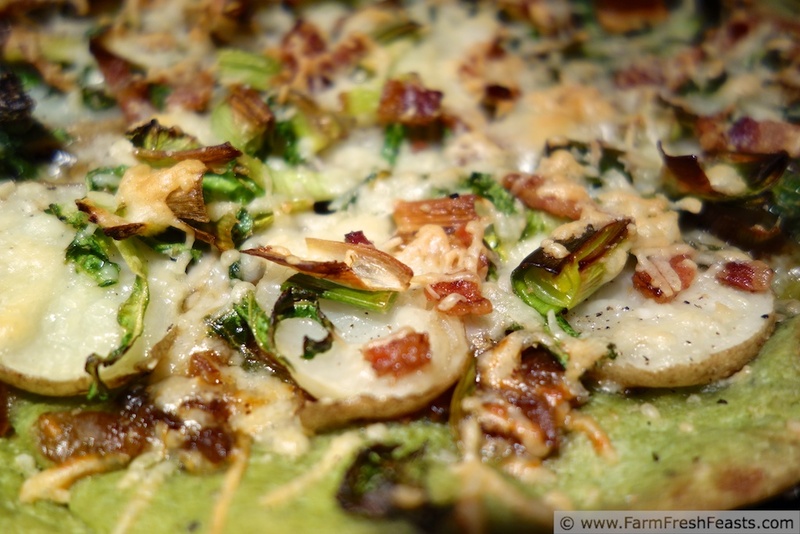 Farm Fresh Feasts: Tremendously Green Pizza (Bacon, Cabbage, Caramelized Onion, Leek and Potato Pizza on a Spinach Crust) Pizza Night! 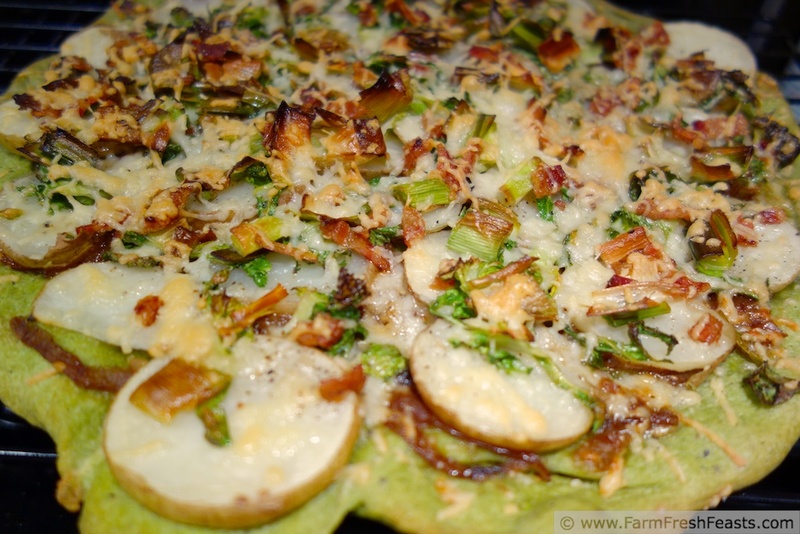 Tremendously Green Pizza (Bacon, Cabbage, Caramelized Onion, Leek and Potato Pizza on a Spinach Crust) Pizza Night! Oh goodness, where to start? 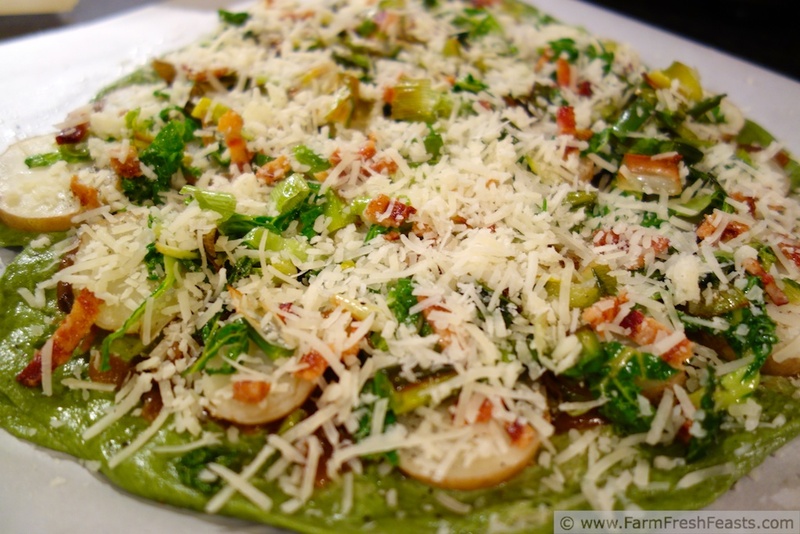 If I was all about pink pizzas last month for Valentine's day, this month I'm into green pizzas. Well, there's also a mushroom medley coming up, and a salmon/arugula one for Good Friday, but still . . . here at Farm Fresh Feasts, March comes in like a green pizza. You'd better get a fork and knife for this pizza. The crust barely has a chance to stand up to the onslaught of ingredients. I mean, I knew that potatoes, cabbage, onions and bacon worked well together. Everything goes better with bacon. But when I got leeks in the farm share I couldn't help myself. 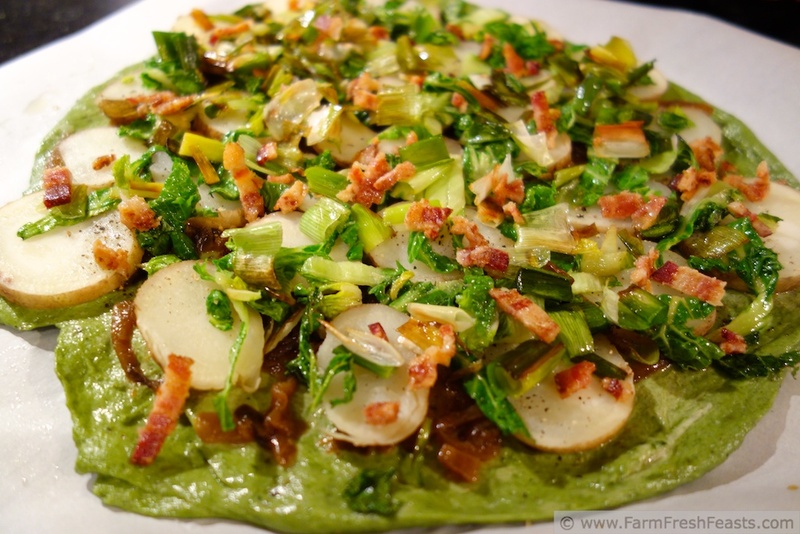 It also seems very appropriate for a St Patty's Day pizza, what with the potatoes and cabbage and utter green-ness of the thing. Went well with beer, too. I'd planned to do a leek, potato, and bacon pizza. Three toppings, the title of the post wouldn't be too long, no biggie. Leek and potatoes go together like salmon and oranges, zucchini and nutella, peanut butter and jelly. But when I was snuffling around in my little fruit and veg freezer (which also happens to be the Extra Pizza Items freezer) debating between garlic oil or _____ for the 'sauce', I saw the packet of caramelized onions I'd carefully saved. Why not a layer of caramelized onions as the sauce? So far, we've got a layer of caramelized onions, topped with potato slices, and leeks, and bacon. That sounds pretty tasty, no? Then I opened the fridge and saw the bags of Chinese cabbage and spinach from the farm share. They were not getting any younger. I know I love a spinach crust, and it was time to inflict a spinach crust on the rest of the family. So the spinach went into the crust. The cabbage (and you could use any cabbage you got for this, I'd think, though red cabbage would necessarily change the title), why not add that just to push this pizza over the edge? Done! Really, if you've put up the ingredients as they come to you ripe/in season/on sale, this sort of thing isn't as crazy as it sounds. It's not like I went to the store specifically to get the ingredients for this pizza. Ha! I think the only thing I go to the store specifically for these days is milk, beer, and grapes. Everything else just kind of happens. Like my life! For general pizza making info, please refer to my Pizza Primer if you'd like. It's got some good stuff and I had a blast making photo collages. Preheat oven to 450 degrees Fahrenheit. My baking stone lives in my oven, so if you have a baking stone or pizza stone (now my kids will say "Or very small rocks? They float, like a duck?") please put it into the oven to preheat. The stone, not the rocks or duck. You're going to want to precook the potatoes, as in this pizza. I did mine in a bucket of water in the microwave for 8 minutes this time. Cool and slice thinly. Set aside. On an oiled piece of parchment paper, stretch out the dough into a circle-ish shape. Do what you like, I'm certainly not picky about this step. Spread the caramelized onions evenly across the top. If you've thawed a packet of previously-caramelized onions, like I did, they will be very soft, jammy, and spread easily into a sauce-like consistency while simultaneously looking like boiled worms. Not the worms that live in my son's closet. Those are red wigglers, and I love them and what they do to my tea bags, banana peels, jack-o-lanterns and houseplants (they eat the former and nourish the latter). Totally remembering this for future pizzas. Not the worms. The caramelized onions as sauce. Top the onions with slices of potato, being slightly picky to make it even. 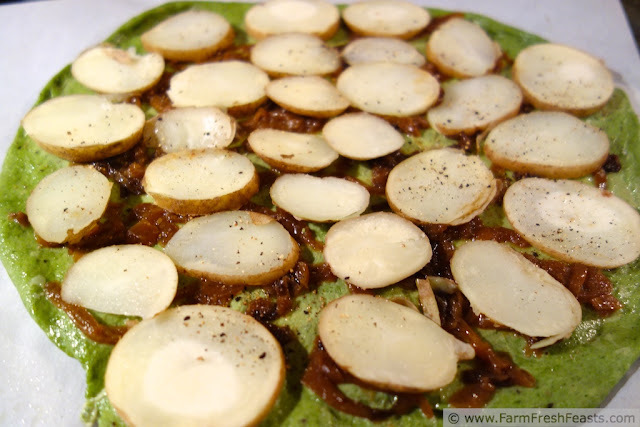 Sprinkle salt and grind pepper across the top of the potato slices. Top with leeks, then cabbage (or, if you aren't picky about that like I am, top with the contents of the skillet). Scatter bacon across the top. You'd be surprised just how far a single strip of bacon will go in terms of flavor. I sure am. Cover the pizza with cheese. Bake, on the parchment paper on your baking stone or a cookie sheet (but if you don't have a baking stone, check thrift stores as I recently saw 2 pizza stones where I work) for 5-8 minutes. Then shimmy the pizza off the parchment paper and continue baking another 3-5 minutes or until the cheese is melted and slightly browned. Cool on a rack, slice, and serve with utensils as it's heavy. Yum! There's no way to go wrong with carmelized onions and potatoes, and the addition of the leeks and cabbage sounds great. I love that you just used a little bit of bacon - enough to get the awesome bacon taste but not to overwhelm the pizza. I'll bet these fillings would be good in a gallette too! I have some CSA cabbage in the freezer - this makes me want to use it this weekend! A galette sounds great to me. 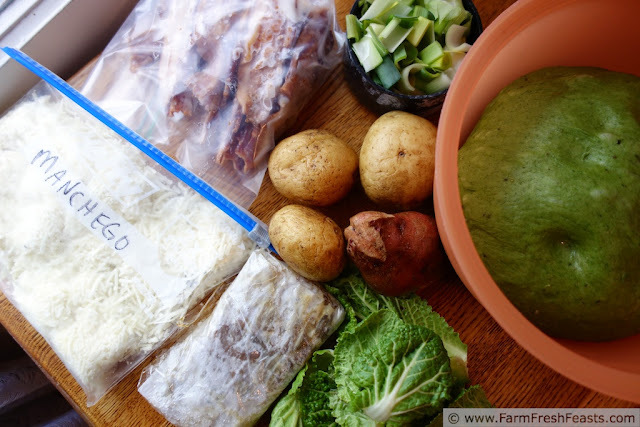 How to you freeze your cabbage? I've never tried that. I don't know why, I freeze kale and collards and beet, turnip, and mustard greens. Great idea. Ah--my daughter eats up all the cabbage, that's why I don't freeze. LOL! This week "Pot of beans" and the coming week "Mediterranean vegetable rice" going to lose? Sounds interesting. I look forward to it! I love love love your spinach crust. You may have mentioned this and I might have missed it. Do you use a pizza stone for all of your pizza creations? I have a very old, worn, and broken pizza stone that lives in my oven (and the title of a poem or essay "Ode To A Pizza Stone" that still lives in my head). I only take it out if I need the extra inch of vertical space, like for a turkey or something. I think you've outdone yourself, and you just made my spinach decision that much more difficult. Pizza, eggs benedict, pizza, eggs benedict. Now I'm really stuck, and I love that you buy milk, grapes and beer still. How's that for an unusual combo. This pizza looks and sounds delicious; makes me crave bacon again. I've been doing some thinking (always a dangerous thing), and I think you need to do a link up party with pizzas. Imagine the possibilities and since you are the pizza queen, you should of course be the host of such a fine affair. Just a random Saturday thought. Oh Kirsten, this looks FANTASTIC!! And you totally had me laughing all the way through this post... "Totally remembering this for future pizzas. Not the worms. The caramelized onions as sauce." Hahaha! Milk, beer, and grapes could be a strange but good combo for Laura. I'll have to look into it. I love bacon. It's the chief reason I am not a vegetarian. So many meats I could happily never eat again in my life, but not bacon. ~Drooling!~ I think you should open up a pizzeria. :) I LOVE your pizza creations!! Ack! Too much pressure! If my family doesn't like a pizza they just tell me. Next month I'll share a pizza I made for someone else and, besides the delivery logistics, it's very stressful cooking and not eating alongside. Besides, we'll be moving at some point, so I need to stay portable--and my pizza stone has crossed oceans multiple times and broken and still works, so I'll stick with being a home pizza cook. Looks heavenly! A perfect St.Patty's day treat. That's what I was going for--thanks for stopping by! Shallots would be wonderful. I planted a bunch of shallots in the garlic/onion bed in the fall, and I have high hopes of a bounty of shallots come spring, so I'll let you know how it goes. Caramelizing the onions makes them very sweet and mild, but I bet shallots would be even milder. My kids will eat the spinach crust (especially with bacon and dripping with cheese) and are now offering new ideas for me to try. Thanks for sharing at the Farm Girl Blog Fest--I always enjoy your posts! Thanks for hosting a terrific hop! Your purple cupcakes are what looks great! I love what you've done with an abundance of pretty purple carrots! I am always looking for new pizza ideas and I'm loving this one! You want new pizza ideas? I may have a few . . . I'm constantly amazed at the variety of produce you get, and quite jealous of your life as a California girl (now the song is in my head. Both of them.). But I'm glad to dream up new ideas for you to try--thanks for hosting!